The San Dieguito Cotillion is accepting requests for invitations all year long. This is a multi-year program to educate the children into self-confident, respectful and poised adults. Season: Consult the Schedule page. Each class is an hour and a half for grades 5-8, and an hour and three quarters for the high school class. Please use the links below to request a new invitation for children that have not participated in San Dieguito Cotillion. Important: Make certain that “cmsregistrations.com” has been added to your safe email list, otherwise emails may be flagged as spam and you may not receive them. ”cmsregistrations.com” is the secure registration site for the San Dieguito Cotillion. 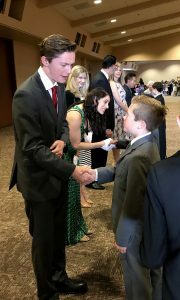 If you need a replacement invitation for a child that participated last season, please email joaniemick@sandieguitocotillion.com and ask for a replacement invitation. For other information, please contact the Cotillion Registrar, Mrs. Joanie Mick. Please check the News Flash page for the latest News.